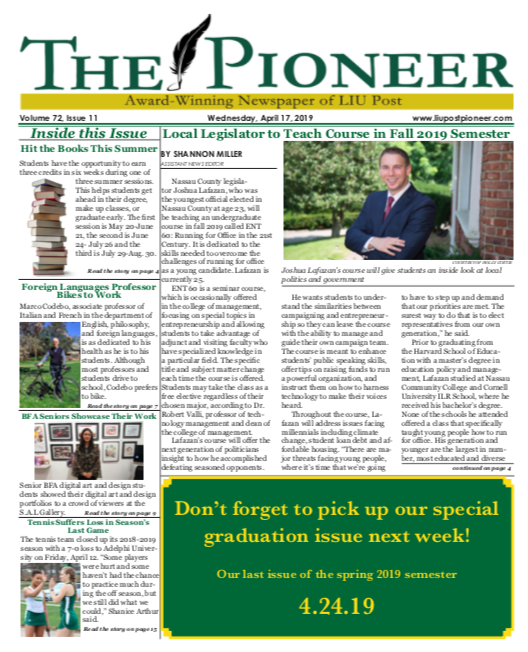 As a service to the campus community, the Pioneer periodically publishes a Crime Blotter. These are the crimes Public Safety reported for the last three months of the semester. On Friday, Oct. 19, Public Safety was notified about damage to a car in the Post parking lot near the South Residence Complex. The victim reported that she last saw her car on Friday, Oct. 12. When she returned to her car on Thursday, Oct. 18, she noticed that her driver’s side mirror was broken and hanging off of her car. The victim reported that she saw a footprint on the mirror and stated that she observed additional damage to other cars parked nearby. Photos of the damage were taken. On Sunday, Oct. 14, at 7:30 a.m., Public Safety was notified by a custodian about damage to the women’s bathroom in Post Hall. A responding officer observed toilet paper dispensers ripped off the wall and shower curtains ripped off the top rail. There was also garbage dispersed on the east wing hallway. The damage is estimated to have occurred between Saturday, Oct. 13 at 10:30 p.m. and the time of the report. On Monday, Sep. 10,a fire alarm inside Lorber Hall went off at 5:46 a.m. The building was unoccupied at the time and the cause for the alarm is unknown. The Roslyn fire chief approved the reset of the alarm at 5:51 a.m.
On Friday, Sep. 7, a Public Safety officer, while on a routine patrol of dormitory areas, observed damage to two tapestry flags on the light posts near the north east side of Kings Hall. The flags appeared to be shredded. The officer further noticed the same type of damage on the south east side of Suffolk residence hall. All other flags in the nearby area were intact without any damage. At the time of the original report, it was unclear whether the damage was a result of malicious misconduct or weather. Security cameras on the quad revealed that the damage was due to a storm that came through the area.